“Singapore is a gold mine”: Re-Orienting global trade flows of secondhand electronics. Guest post by Creighton Connolly. In this post, I will discuss a chapter from my forthcoming MA (geography) thesis, which concerns Singapore’s role in facilitating this global trade and traffic in electronic waste (e-waste). I spent last summer in Singapore where I was tracking the trails of secondhand electronics for three months, and interviewing those involved in handling it. I found that Singapore is important not just a trans-shipment hub where much of the world’s e-waste stops for a few hours, before heading to a new destination, but also as a significant source in itself. Throughout the many months spent conducting fieldwork and writing my thesis, I have struggled with the use of the term ‘electronic waste’ as a name for the materials which I am studying. It is perhaps the most widely used term, at least within Western contexts and within the few academic works on the topic. However, the term e-waste is very much resented by some individuals who make their livelihoods by capturing the significant value contained in electronic waste, such as the secondhand electronics traders I met in Singapore. Therefore, in what follows, I have used various terms such as used or secondhand electronics, and electronic waste interchangeably depending on the context in which I am using the term, and how my correspondents in the field referred to the material. The understanding that countries like Singapore are a source of secondhand electronics would go against the dominant story line presented in the mainstream media and NGO reports from organizations such as Greenpeace and the Basel Action Network (BAN), which use images like the one below which portray the ‘e-waste crisis’ – ‘Third World’ women and children informally processing the Western world’s ‘e-waste’ without any protection for themselves or for the environment around them. My point here is not to deny that this happens, because it surely does, and it is not an ideal way of handling secondhand electronics. But rather, I would like to tell an alternative side of the story that isn’t as commonly heard, but is just as prevalent. However, the continued effectiveness of the Convention is in question because it is now becoming clear that most of the world’s e-waste will be produced in the developing world by no later than 2015, as forecasted in the figure below. 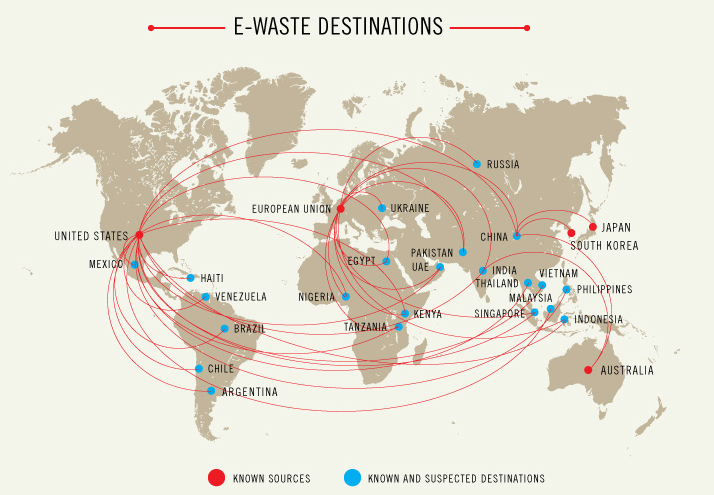 For instance, China actually generates the second largest amount of e-waste in the world (behind the US), with between 2.3-2.6 million tons generated annually (UNEP 2009), which begs the question why it is labelled as a ‘source’ on the above map. Moreover, according to Mr. Verhagen, an independent e-waste consultant in Singapore, of everything that is shipped in to Singapore, a smaller percentage stays there. This is because the majority of Singaporean’s don’t use secondhand electronics as the level of affluence is so high that only the very low classes will buy them. According to the International Monetary Fund (IMF), Singapore’s (2011) GDP per capita is $50,714, which is the 11th highest in the world, and higher than that of the USA ($48,147, 15th). So, again, this begs the question of why is Singapore labeled as a destination on this map, and why it is considered a developing country by the Basel Convention. Supporting these claims, geographers Josh Lepawsky and Chris McNabb, have recently documented that there is significant intra-regional trade in secondhand electronics taking place within the world’s developing regions, which accounts for a majority of the total volume of trade taking place there. More specifically, Lepawsky and McNabb point to sites such as Singapore, Hong Kong and Dubai as key jurisdictions that facilitate both licit and illicit trade of secondhand electronics. Furthermore, A 2007 Business Times report underscored the Singapore’s role as a trade hub for secondhand electronics by pointing to the small amount of electronics collected by take back programs in the country. As the article documented, Singapore’s collection drives for secondhand electronics, sponsored by IT firms such as HP and Nokia, generate less than 10% of similar programs in the US and Western Europe. While collection programs in those countries tends to happen year round, with large turnouts, they occur infrequently, and at random in Singapore. Nonetheless, it is clear that Singaporeans generate at least as much e-waste as their counterparts in Europe and the US. For instance, For instance, the percentage of Singaporeans with mobile phones was 140.7 per cent in June, 2010, which is higher than any other country in Southeast Asia (Ng 2010). Adapted from: J. Yu, et al. 2010. “Forecasting Global Generation of Obsolete Personal Computers”, Environmental Science & Technology Vol. 44, 2010, 3232-3237. 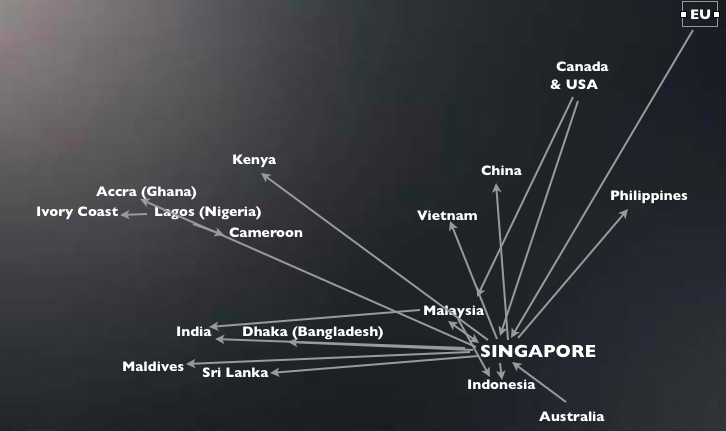 From my interviews in Singapore, I learned that many of the foreign traders are attracted to Singapore because of its status as a trans-shipment hub, due to the many shipping connections linking ports worldwide (as shown in this map produced by the Singapore Port Authority), as well as the high quality of the secondhand electronics originating from there. As my respondents pointed out, these electronics are generally of high quality in the city-state because Singaporeans and private sector institutions only use computers for three to five years before upgrading their systems, while corporations sometimes ‘refresh’ as often as every two years. Such short periods of use mean that electronics consumed in Singapore still have a long lifespan after being initially discarded. Marketable secondhand items will be sold by the secondhand electronics traders in Singapore, and sold for consumption overseas, while others will go directly to electronics recyclers in Singapore, like Cimelia or TES-AMM, or will be incinerated at one of Singapore’s four waste to energy plants, after which the ash is deposited in Singapore’s only landfill (Semakau Landfill). Most of the foreign traders coming to Singapore to buy used electronics in bulk to ship back to their home countries come to Little India shops to purchase their stocks. One Bangladeshi trader in the area, by the name of Dewan, says his main overseas buyers come from Nigeria, Sri Lanka, India, Bangladesh, Kenya, China, The Philippines, Vietnam, Malaysia and Indonesia. Every month he receives about 10-20 buyers, most of these being return customers who have been coming for the past three years. These trade flows are visualized on the diagram above. One of Dewan’s buyers, a Nigerian who goes by the name of T-Ray, told me that Lagos has many shops run by foreign traders such as himself, who buy electronics overseas, so the city acts as a hub of high quality, secondhand electronics for other buyers in Western Africa, like Cameroon or the Ivory Coast. This demonstrates clearly that many countries in the world act as both sources and destinations for secondhand electronics. Therefore, we can not classify countries as either sources or destinations of secondhand electronics, as was done in the map I displayed earlier, and as conceived in the Basel Convention. Trade flows of secondhand electronics to and from Singapore. One way that Singaporean traders get their equipment is by distributing flyers like the one shown below to households and businesses in Singapore. Another is the government electronic business (GeBIZ) website, which many of the local traders based in Singapore use. The bulk of Government Procurement (GP) activities in Singapore, which are conducted through this website is decentralized to public sector organizations (PSOs) such as individual Ministries, Departments, Organs of State and Statutory Boards, who can post invitations for quotations and tenders to sell off their retired electronic assets. However, they must adhere to central procurement guidelines issued by the central government’s Ministry of Finance. Local traders in Singapore can then register their business as GeBIZ trading partners (GTPs) online, and make bids on the equipment electronically. An IT procurement letter given to me by a used electronics trader in Singapore’s Little India. To wrap up, we can see that the GeBIZ program, the small amount of electronics collected in take-back programs, and the clustering of secondhand electronics shops firms within Little India, as well as the large numbers of foreign traders coming in to Singapore underscores its role as a global source of secondhand electronics. It also confirms Lepawsky and McNabb’s assertion that trade within developing regions is increasing in prevalence due to the falling price of electronics and increasing affluence in those countries. This finding thus makes the Basel Convention largely irrelevant, as it only bans trade from developed to developing regions. Yet, it is clear that Singapore generates at least as much, if not more electronic waste per capita than European and North American countries. Therefore, national e-waste legislation, as well as international policy aiming to reduce the international flow of secondhand electronics, such as the Basel Convention as well, needs to take seriously the role that countries like Singapore play as significant sources of such devices. Basel Action Network (2002). Exporting Harm: The High-Tech Trashing of Asia . Greenpeace International (2009). 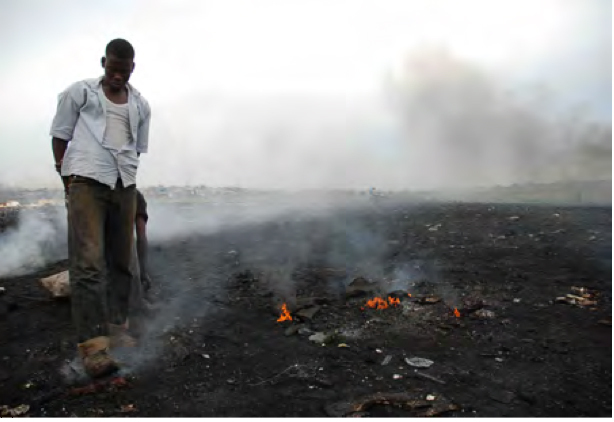 Chemical contamination at e-waste recycling and disposal sites in Accra and Korforidua, Ghana. IMF, World Economic Outlook September (2011). Lepawsky, J. and McNabb, C. (2010). Mapping International flows of electronic waste, The Canadian Geographer 54 177- 95. Ng, G. (2010). Singapore’s E-waste gets new life My Paper, 14 Sep.
Phan, M. (2007). ‘Very little’ e-waste recycled in Singapore. Business Times, 21 September. United Nations Environmental Program (UNEP) 2009. Recycling- From E-waste to Resources United Nations Environment Programme & United Nations University, Berlin. Yu, J. et al (2010). 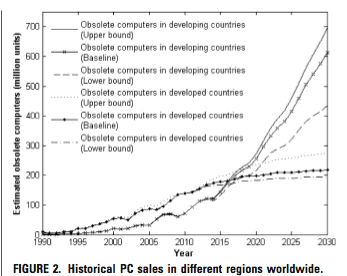 Forecasting Global Generation of Obsolete Personal Computers. Environmental Science & Technology 44 3232-37. This entry was posted in e-waste, Economics/Economies, World. Bookmark the permalink. Thank you for this insightful article. Acknowledging the circular nature of the global electronics trade, we can begin to focus on the local production cycle. As many of the tools for recycling and PCB manufacturing increase in automation, reduce in scale and cost, we have a unique opportunity. We can envision a facility that would reduce the energy created by excess shipping and transport. A Whole Life Cycle Computing facility where old technology enters, and new technology leaves. Implemented in a unified manner, the electronics would be designed to be recycled, capturing more lost energy in the life cycle of the product. Sustainable computing will be a reality and acknowledging the reality of the current electronics trade is our first step towards bridging that gap to the future. Have you heard of the company BioMine? They are a new startup company in San Fransisco and are interested in many of the same ideas that you mention here.